Dream big and climb two of the Tour’s most legendary mountains…in one day! You’d be hard pressed to think of two more epic Tour de France climbs to conquer on the same day. While Alpe d’Huez sits among other giants in the French Alps, Mont Ventoux has a majestic perch right in the middle of Provence, in sunny southern France. Although they are not neighbors, it is only a relatively short 3.5 hour transfer between them, making a day trip not only possible, but nearly essential for that cycling Bucket List we all have! If you are in Provence and want the ultimate one-day cycling experience, just let us know. Prices start at €275 per person (for two riders). See the Day-to-Day tab for what your day might look like or contact us if you have any questions. *This epic day trip can be made part of one of our short-stay BreakAway tours, either in Provence (Luberon Valley) or near Mont Ventoux. 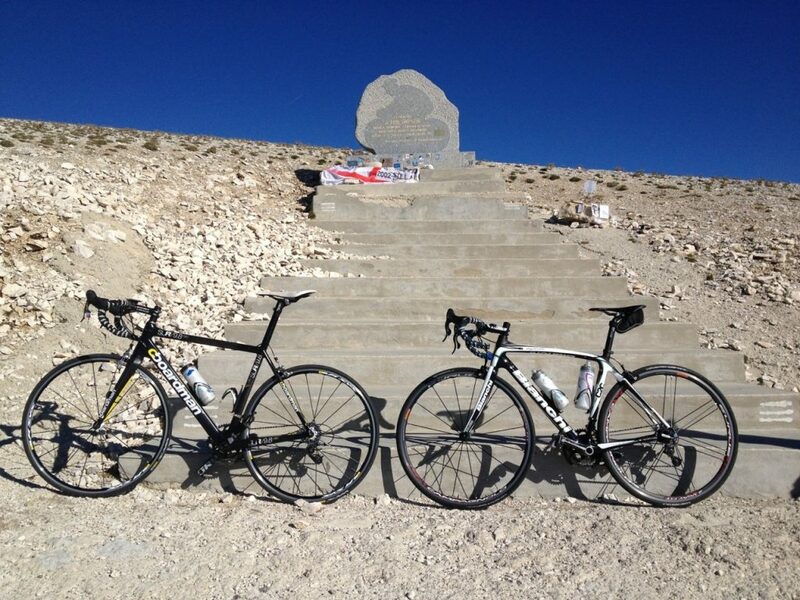 Check out our Ventoux BreakAway Tour page or contact us for more details. We’ll pick you up from your hotel for an early morning attack of Mont Ventoux. After a ’briefing’ on what to expect on your climb, you’ll hit the road. 44|5 will be waiting every few kilometers on the climb to offer support, encouragement, water and food. After a successful Mont Ventoux climb, we’ll be at the summit with warm clothes for the descent, and of course, a few photos at that famous sign! After descending the mountain, you’ll do a quick change, grab some lunch and hop in our vehicle for the transfer to the Alps. From Le Bourg d’Oisans, on the valley floor, you’ll start climbing those famous 21 turns, right to the top of the Alpe d’Huez ski resort and across the official TDF finish line. Following a well-deserved celebratory drink overlooking the vast Alpine valley you left behind a short while ago, you’ll change back into your street clothes for the return drive to Provence, just in time for dinner!